If your computer starts malfunctioning, freezing or operating slowly, your first instinct may be to take the machine to a computer repair store. However, most computer repair technicians use processes and software to complete computer repairs that you can do yourself at home. Although repairing your computer may seem like a daunting task, you can save time and money by taking steps to troubleshoot and repair your device before taking it to a repair shop. One of the first things you should do after getting a computer is to install an antivirus program. In many cases, a computer that is constantly freezing, automatically restarting and displaying error messages is infected with a virus or some type of malware program. There are several reputable computer security companies, such as AVG and Avast, that offer free versions of their anti-virus products for download. Running a scan will find and remove any harmful software on your hard drive. In addition, according to the United States Computer Emergency Readiness Team, you should perform regular automatic or manual anti-virus scans to ensure your computer remains protected. Many programs, apps and operating systems have a process or method to recover information that you accidentally deleted. For example, you can recover lost individual files by running the Windows System Restore utility, which can restore Windows to a point in time before you deleted the files. Many repair technicians simply use your computer’s native utilities and programs to recover your deleted files. If your computer is running slowly because there are too many installed programs, bloatware or uncontrolled background processes, a factory reinstall of the operating system can solve the problem. This is often a preferred method of fixing many computer problems because it ensures any registry errors or unforeseen problems are also eradicated. Use your operating system’s restore process to complete the operation, such as the Reset feature in Windows. 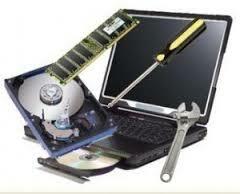 If applicable, back up your personal information before performing the reinstall operation. Unless your computer has a sealed chassis, it is a relatively simple process to swap out many common and upgradable computer parts, such as the hard drive. In most instances, you only need to remove your computer’s case to get access to the parts. Your operating system usually displays a warning message if a component is about to fail. Contact your computer manufacturer to get the appropriate part and then follow the instructions in the user manual to perform the replacement. Although there are some repairs that require an advanced understanding of computer systems, such as correcting a registry error, many repairs only require some time and your patience.